Do you want to increase your sales qualified leads? Using a product demo or a free consultation as your lead magnet–combined with a high-converting optin form–is an effective way to capture high-quality leads from your website. In this case study, we’ll share how one company used OptinMonster to increase their sales qualified leads by 141% in just one month. 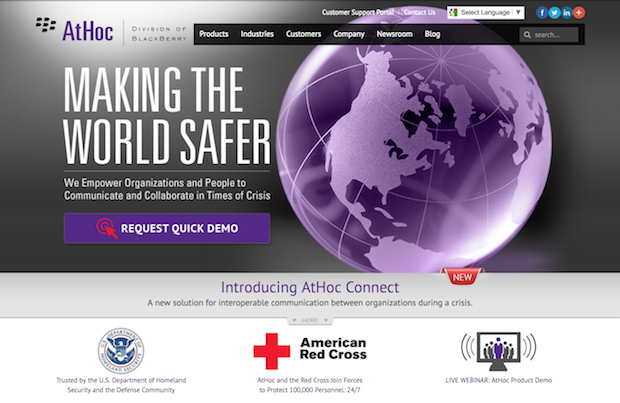 AtHoc (a division of BlackBerry Limited) is the pioneer and recognized leader in networked crisis communication. They help to make the world safer through their suite of emergency notification applications, used by the U.S. Departments of Defense and Homeland Security. 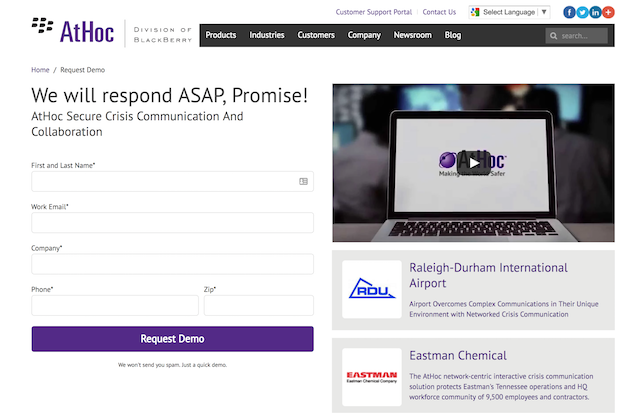 AtHoc’s goal was to increase product demo requests made by potential customers visiting their website. 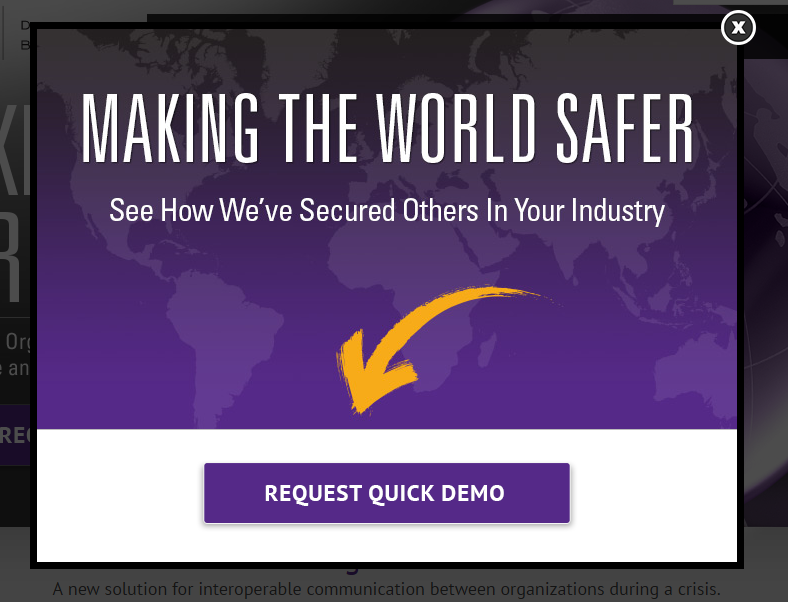 They saw that other companies were seeing success with popups, but they weren’t sure how their audience (comprised of top security executives and government decision makers) would respond to them. 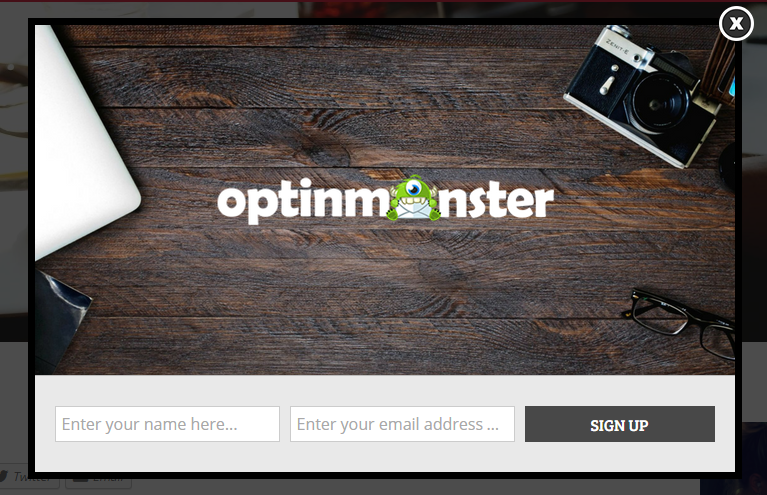 However, when they saw the incredible results others have seen using OptinMonster’s exit-intent popups, they were excited to give it a try. First, AtHoc added an OptinMonster lightbox optin to their website using our “Bullseye” theme. This theme provides a large placeholder for a custom graphic above the call to action. …and this is what AtHoc’s first optin form looked like. 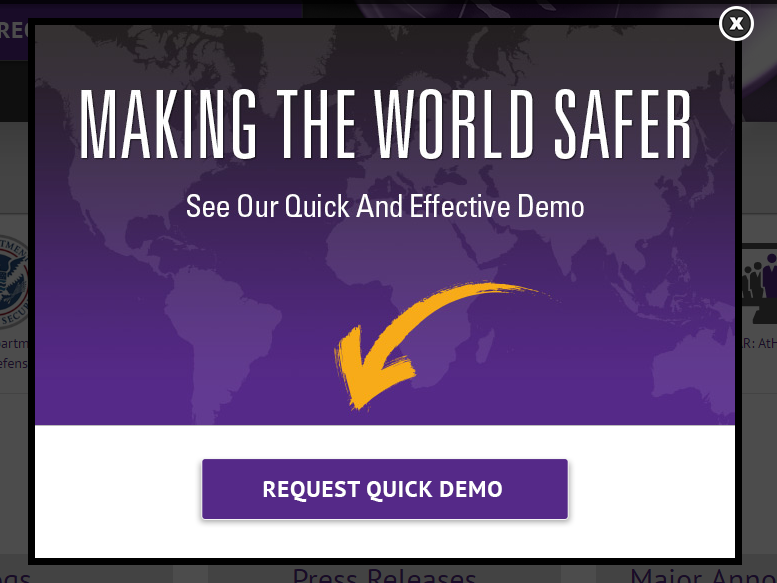 As you can see, the copy asks visitors to request a quick demo of their product. They included a bold headline, “Making the World Safer”. 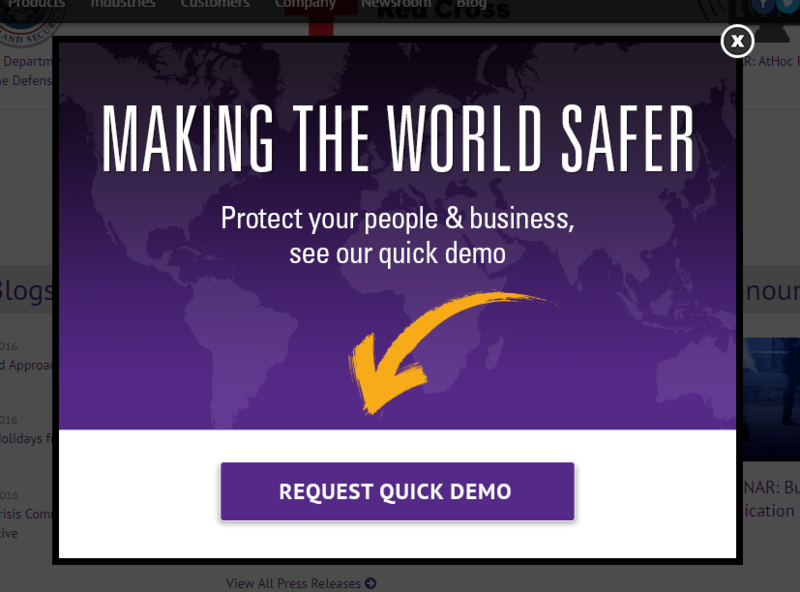 The subhead read, “Protect your people & business, see our quick demo”. For the call to action, they used our Yes/No feature, and disabled the “No” button. They also changed the “Yes” button copy to read, “Request Quick Demo”. Then, they set the “Yes” button to redirect to a landing page with the demo request form. Here’s what that landing page looks like after clicking the “Request Quick Demo” button. Using our Display Rules, they set the lightbox to appear 20 seconds after the visitor enters the site. This first version converted at around 2.71%. Prior to using OptinMonster, demo requests comprised 23% of AtHoc’s overall lead volume. These leads were driven by call to action buttons and forms embedded in their content throughout their site. However, their primary source of leads came from their Contact page, which brought in more leads than any of the other demo request forms or call to action buttons. In just one month after implementing the lightbox optin you saw above, AtHoc saw an immediate 141% increase in sales qualified leads coming through the site. This optin alone comprised 53% of their overall lead volume! Not only that, but the percentage of leads converting into sales also increased. This means that lead quality also increased, probably as the result of using a product demo as their lead magnet combined with OptinMonster’s page level targeting technology. After seeing success with the intial lightbox optin, AtHoc used OptinMonster’s A/B testing feature to begin split testing different variations of their optin. In one variation, they changed the subhead to read, “See Our Quick and Effective Demo”. This variation converted at 2.98% (a slight increase over the original variation). They also tried another subhead, which read, “See How We’ve Secured Others In Your Industry”. This variation was the winner, converting at 3.41% (a 0.7% increase over the original). AtHoc liked how easy the split testing tool is to use, and also loved the fact that our optin designs are so easy to customize with minimal graphic design effort. Building an email list wasn’t the goal for AtHoc. Increasing demo appointments was, and OptinMonster helped them to do that. The success of these product demo optins proves that, with a good lead magnet and the right technology, popups can be a great asset to any business website. The percentages of lead volume across our various site forms was turned on its head. For years, the straight ‘contact us’ was our #1 form source for leads. After one month, the forms driven by OptinMonster comprised a whopping 53% of overall volume, and drove a 141% increase in month over month lead volume through that form. The results came quickly, and left little doubt about the effectiveness of the product.